At no time in history past, since the world began, has a virgin given birth to a child nor is it humanly possible. Either Isaiah was a crazy liar or he was speaking the words of God. As it turned out, Isaiah’s prophecy was fulfilled when Jesus was born of the virgin Mary. It is confirmed in the Gospels. In fact, Matthew quotes Isaiah’s prophecy WORD FOR WORD in Matthew 1:23 to make sure that no one gets it wrong or misses it. The Quran which came 1400 years after Isaiah, and 600 years after Matthew, repeats what was prophesied and written more than a thousand years earlier in the Bible, about the virgin birth. God had already planned this birth thousands of years before it happened. The Bible reveals the prophecy as well as the fulfillment of the prophecy. And the purpose for it. The Quran has a whole sura dedicated to Mariam but gives no reason for the purpose of the virgin birth. Mariam is said to be the sister of Harun and the daughter of Imran. However, this raises some questions because according to Bible scholars, Mary’s father’s name is Heli (drawn from Luke’s genealogical record.) Mary has a sister (John 19:25) and a cousin, Elizabeth but there is no mention of any brother and her father’s name was definitely not Imran. There is no record anywhere for a thousand years to back up what the Quran claims in the 7th century AD. So who is this Imran & Harun that the Quran claims are the father and brother of Mariam? 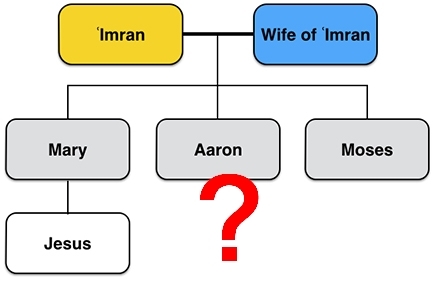 Muslims scholars have tried to explain it away for decades in claiming that Mary-Imran-Aaron was not a physical relationship, but in doing so they contradict the Quran as you can see if you carefully follow the following verses which connect Mary and Imran and his wife, Aaron and the virgin birth. Was there confusion because Mariam, the mother of Jesus, had the same name as another Mariam? That Mariam (Miriam in the Bible) was the daughter of Amram (Imran in Arabic) and the sister of Aaron (Harun in Arabic) & Moses (I Chronicles 6:3). So te Quran got that absolutely correct! BUT…that Mariam lived 1500 years before Mariam, the mother of Jesus! Was Muhammad aware this huge As he was illiterate, he did not have the opportunity to read the Torah or Zabur or Injeel and make a comparison. Could he have listened to Jews reading their scriptures and heard the name Maryam (Miriam) – Imran’s (Amram) daughter and Harun’s (Aaron) sister, mentioned in the Torah? And could he have heard Christians reading the Injeel where Mariam (Mary), the mother of Jesus is mentioned? Can you really blame Muhammad if he thought that both the Mariams were the same person!? It’s a mistake anyone can make. Muhammad’s fascination with Mariam does not end there. So which is the Mariam that Muhammad said will be his wife in heaven? Mariam, the mother of Jesus or Mariam, the daughter of Imran and sister of Moses? Or was it just all a colossal divine mix-up?